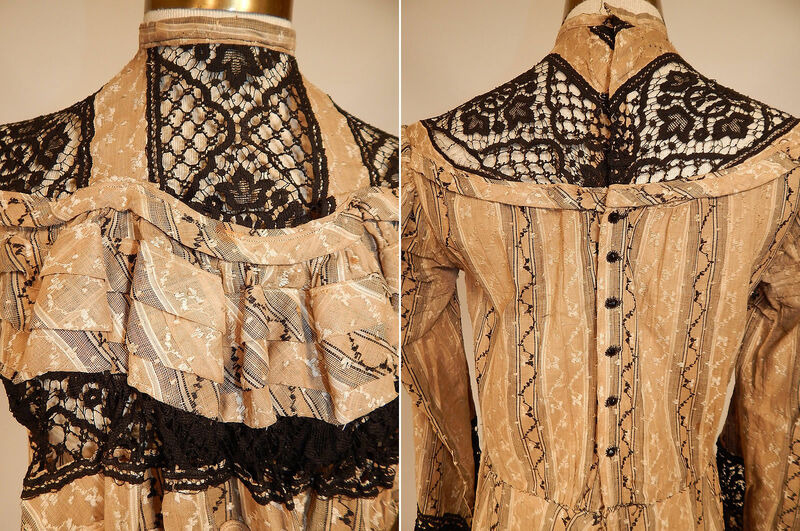 This antique Victorian era brown and white cotton calico striped black lace trim dress dates from 1900. It is made of a light brown tan color and white cotton calico floral striped damask weave batiste fabric, with decorative black stitching details and black lace trim inserts. This beautiful summer tea gown dress is a long floor length, with a hemmed shortened full skirt, high neck collar, pleated, lace yoke trim top, long full bishop style sleeves with fitted cuffs, tiny black buttons, hooks for closure down the back and is sheer, unlined. The dress measures 51 inches long, with a 28 inch waist, 36 inch bust and 24 inch long sleeves. It is in good condition, with only a small faint age spot stain on the front top, some separation in the lace trim along the back yoke and skirt (see close-up). 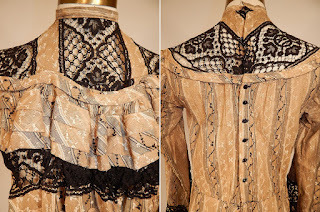 This is truly a wonderful piece of wearable antique Victoriana textile art! Based on the sleeve shape, probably about 1903.